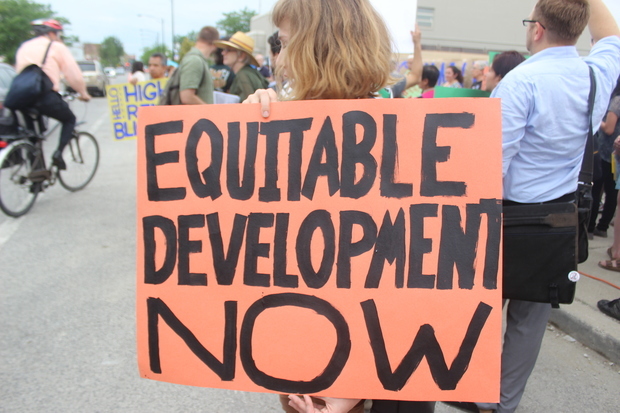 LOGAN SQUARE — The first of several large-scale residential developments coming to Logan Square attracted protest from affordable housing and anti-gentrification advocates Wednesday, setting the stage for a series of similar efforts on the bustling Milwaukee Avenue strip. A group of around 40 residents and neighbors gathered at the future “L” building, 2211 N. Milwaukee Ave., which broke ground in April touting 120 new luxury units (including 12 affordable units), LEED certification and monthly rents starting at around $1,500. 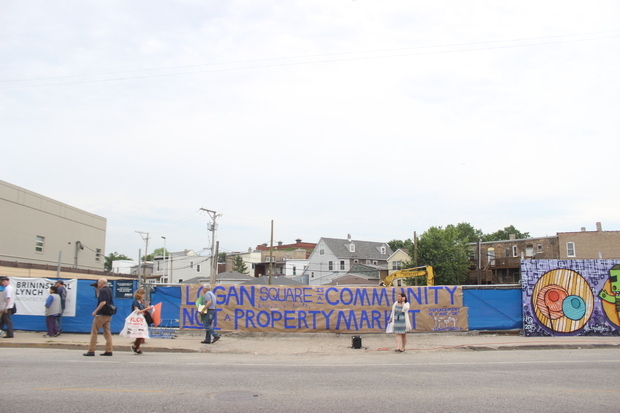 Members of Somos Logan Square and Grassroots Illinois Action organized around the early stages of construction underway at the site, which has doubled as an outdoor art exhibit since January, when a large glowing “L” appeared in the vacant lot overnight. They then walked less than a single block north on Milwaukee Ave. to a vacant lot that will provide a foundation for Logan Square’s so-called Twin Towers, because, they said, the towers, the “L” project and similar developments coming to the neighborhood represent a trend of gentrification and eventual displacement. Newfield was on his way home via the Milwaukee Ave. bike lane when the group drew his attention. “This is absurd,” he said. Developments that take advantage of nearby mass transit and dense residential construction help increase housing supply and ease demand, Newfield said. At the "L" site, longtime resident and “L” protestor Robert Castillo pointed out his childhood home, located directly behind the construction site. 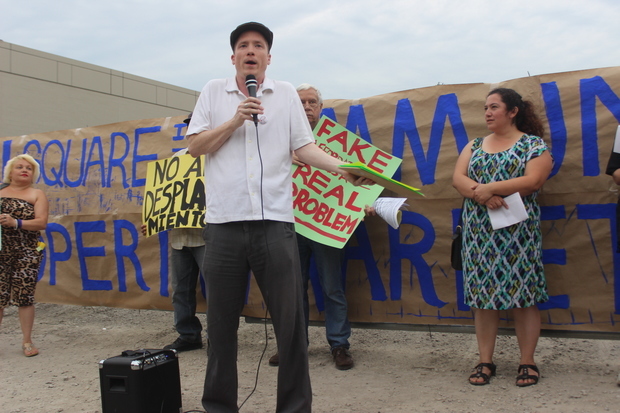 And 54-year Logan Square resident Joe Kopera noted that his own home is two blocks away. Property Markets Group principal Noah Gottlieb declined to comment on the protest.